Our wonderful motley crew of Thanksgiving participants began to roll in last night bearing traditional Thanksgiving foods like kibbeh, fatoush, zaatar bread, hummus, laban cheese, olives and grape leaves- Yes, once again, long time Green Hope Farm friend and former staff goddess Catherine Boorady brought us a marvelous night before Thanksgiving feast of Lebanese foods. And so I send love and blessings to all of you from one part of the melting pot to yours and I raise a toast to the way we mix worlds and cultures with such wonderfully diverse foods and faces round the table! PS The dogs here are having to find a melting pot of harmony as well. 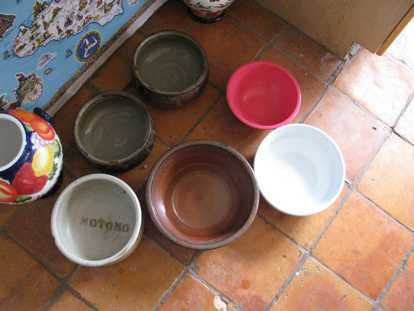 Here are the visiting and resident dogs’ bowls ready for their Thanksgiving meal! I know. I know. It IS completely oxymoronic, even moronic, to bemoan the technology of the age while blogging on a computer- But sometimes I do wonder where this is all going. At a soccer game on Saturday night, I sat next to a college student who clutched two iphones, one in each hand, one of which connected to an ear piece in his ear. I tried to keep my eye on the game but felt a sick fascination at someone who could do so much communicating and apparently make sense, though I must say that the conversation he was having with the 3D person to his right had a sort of autopilot feel, and I don’t think he was noticing the fine points of the game. Nonetheless, he had so many cutting edge communication mediums in play, my head was spinning. And frankly, it was already spinning from an afternoon I’d spent sorting out an enormous collection of Flower catalogs a friend gave me. As you can imagine, decorating our packages with photos of Flowers requires a lot of photos. When a friend who runs a vegetable and flower stand offered to give me their farm’s outdated wholesale catalogs, I was delighted. During the drop off of this mother load of catalogs, my friend Sarah told me of her consternation about a convention for garden businesses that she had just attended. She reported that the marketing workshops had been beyond frightening. Apparently using designer names for all new hybrid Flowers and vegetables is all the rage. Just what the world needs, Gucci parsnips. I guess those who carry two iphones stay better in touch with what is happening in the agribusiness world than me, because everything I was looking at reminded me of a GM production line. And sounded like it too. My response? Are tests for steroids needed here? And I thought it was the plants that were supposed to be eye-catching. “4.25 Grande self symetricize (registered trademark) container and flat filled display tray (patented) uses a unique version of our symetricize system. When used with automatic pot dispensers, containers shift into place perfectly in the tray-without assistance- to align logo and tag locator spots. Then there were the many catalogs proudly describing the journey of 10,000 miles that each of their six week old seedlings had taken. Do we all really want to buy plant plugs that start their life in Spain then get shipped to Georgia then trucked to us all before they have their first bud? I guess the designer labels begin to make sense when you realize that every member of the Rockapulco series on offer has travelled more in six weeks than most of us will travel in a lifetime. During the spring, my much too small greenhouse is full of pots that are perched precariously, have popsicle stick labels and do not match. I still believe in dirt and seeds and I use them. Together. My children send me on errands with the family cell phone and I am too embarrassed to tell them I don’t know how to turn it on. And Jim, if you are reading this blog, I would love a bouquet of Flowers. Spare me the vegetative growth. And last but not least, Sarah, if you are reading this blog, I feel your pain. And I am not sure a Supertunia named Vista Bubblegum is going to ease it. November is an oddly colorful time here with brooding purple skies broken by immense flocks of birds and hillsides of burnt sienna oak leaves punctuated by evergreens and the gray brown architecture of leafless trees. It is still sort of a gloomy month though, partly because most of us know what is coming and partly because, as our weather people tell us, it is our cloudiest month with only 30% sunny days. This 30% number seems like a high estimate to me as I can only recall seeing the sun twice since November started almost a week ago, and then it only showed itself for a few minutes. 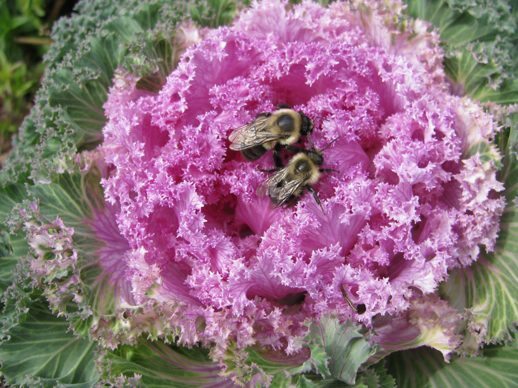 We console ourselves with brisk walks and a rapt study of the few moments of unusual color- like this flower kale and its pair of intrepid bees. As we talk to those of you in warmer climates, it begins to be the time of year when we long to hitch a ride in our packages to you for a visit in your balmier worlds. This year, we do have the gift of Thembi to help us see beyond the chill of New Hampshire to the wonder of it all. On the first day there was ice on the koi pond, Thembi came into work in a state of awe bordering on disbelief. She reported that her husband Charles had told her that come winter she would be able to leave a cup of water outside overnight and in the morning it would be ice. She had thought he was teasing her but on that day she had found out this was true. We looked at the koi moving sluggishly below the skim of ice and saw it all afresh through Thembi’s eyes. At the close of the week, several of us met up with Thembi at a giant used winter clothing and equipment sale. As people raced by with carts full of vests, coats, snow pants, mittens, hats, skiis, snowshoes, boots and skates, we tried to explain to her all the layers she and her boys would need. Her questions made us laugh at our selves and our funny, funny winter world. How did any of us walk with these big heavy sorel boots on our feet and why would anyone possibly need them? Would she and her boys require snowpants or would activities like sliding down a hill on a plastic disc pass them by. And why would any of us put on those long cross country skiis and push ourselves around a field with sticks? Did even tiny Andile need these big klunky hockey skates and whatever for? Snowshoes? Why on earth would anyone possible need to have such wide feet? For a moment we were all strangers in a strange land, seeing winter, this over the top season, in all its ridiculous splendor.